A rendering of the improved 2 South St. building that will house Equilibrium Brewery’s second Middletown location. MIDDLETOWN—The City of Middletown announced recently that Equilibrium Brewery closed on the purchase of the former TD Bank building located at 2 South St. in the City of Middletown on March 1. The vacant property has been owned by the city since 2011. • The remaining $400,000.00 will be paid to the city by payments of $100,000.00 on the anniversary date of the closing for each of the next four years. Equilibrium purchasing the property to expand Equilibrium’s current operations and existing facility that is located at 22 Henry St. Within two years of the closing, Equilibrium will fully use the first floor and the basement of the building for brewery operations (beer production and tasting). 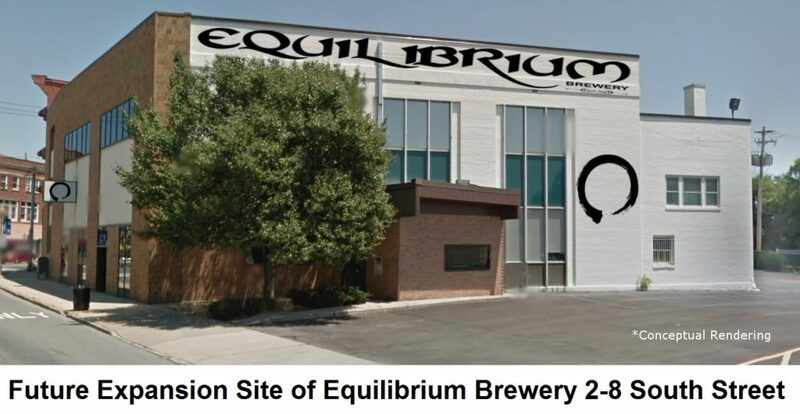 Currently located at 22 Henry St. Equilibrium Brewery plans to expand its brewing operations to keep up with demand. Plans for the second location include an enclosed pavilion and patio where can and bottle releases will be held. The pavilion will also serve as a tasting room, and future plans for the building include a possible restaurant on the upper floor. Equilibrium Brewery plans on investing more than $2 million into the project. Due to this increased popularity, Equilibrium has decided to centralize its can and bottle releases at the new location, which will allow their patrons to congregate in an enclosed space rather than the parking lot. Historically 2 South Street has been a bank location, originally Middletown Savings Bank and most recently a TD Bank branch. The bank closed in 2010 and the city acquired the property in 2011. City officials were pleased that the city is seeing another adaptive reuse project bring new life into a vacant building. “This expansion will continue to create more jobs and repurpose another building in our Downtown,” said Maria Bruni, director of economic and community development for the City of Middletown. Equilibrium’s original Henry Street project was awarded $204,000 in funds through Empire State Development in 2015.